How did you get interested in cooking, and why did you decide to become a chef? I got interested in cooking at a young age because I grew up having large gardens at my parents’ and grandparents’ homes. My uncle had raspberry farms, and about everywhere you looked there were dairy farms, apple orchards, and people growing hay for livestock all around the Pacific Northwest. We grew up cooking and in the kitchen; it was a very comfortable place to be in the house. It became our testing ground for new favorite recipes, the tradition of a family favorite, and also the learning curve of a failed experiment for new flavors. How much impact did your childhood experience of growing up on the farm have on your cooking philosophy and style? Growing up in Ferndale, WA, had a profound effect on my life now that I look back on it. We worked as kids and that instilled the work ethic I have today. If you wanted something, you set goals for it and worked toward making it a reality. My very first paying job in grade school was picking strawberries during summer break. It was a chance to meet different kids from different neighborhoods, and my whole world started to open up. What is your approach to sourcing food? My approach to sourcing food starts with asking the right questions and using a lifetime of food experience to guide my decisions. The relationships you build with your purveyors are absolutely critical. You have to develop a reputation for being open-minded, level-headed, and honest. Above all else, you must have integrity in yourself and your food. You were hired at 19 to perform food prep, and then moved through a dozen stages of working in the kitchen. What did you like best about your culinary education experience? I got my first restaurant job the week I got my learner’s permit. From there I saw that I could grow and excel very quickly through new tasks. I applied for culinary schools at 16, and was getting set up for my first apartment when I moved to Seattle at 17. Things get real, real hectic when you’re on your own, going to school, studying, working full-time, and feeling the weight of being a young adult in a big city. It was very difficult being on my own for the first time, but also extremely exciting knowing I was on my way to starting my career. I owned my mistakes and my whole life was up to me. What customer experience do you strive for? I want people to embrace new foods and flavors, and feel empowered to buy new ingredients, get out of their comfort zone, and experience new cuisine. I want people to feel like their food tells a story of a time and place, that it’s not just a collection of ingredients. 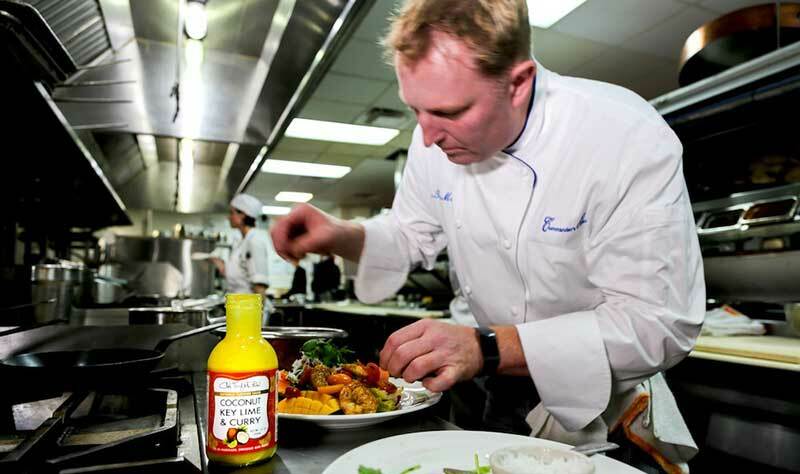 Having lived in the tropics as a professional chef, and having a New Orleans pedigree and international experience, I’m ready to share some inspiring, creative cooking and transport people to exciting places. Who were your chef role models when starting out? Jamie Shannon was my first real chef role model and mentor. He showed me what it was like to run a big kitchen like Commander’s. He had a larger than life personality and was a towering force in and out of the kitchen. He had style, grace, and everyone wanted to be like Jamie. What are your most memorable takeaways from your stints in Vegas, the Virgin Islands, and the Michelin-starred London restaurants? When I moved to London at 26, I felt like I was at a turning point in my career. I was leaving my first restaurant chef job at the Breakers Hotel in Palm Beach, FL, and was only good enough to work salads and the larder there. The caliber of cooks in that kitchen exceeded anything that I could have prepared myself for. I worked and studied food each and every day in one of the greatest food capitals in the world. After working hard for seven months, I was broke, exhausted, and needed a break, so I moved to the Caribbean and started working in St. John, USVI. It was a huge transition from a busy kitchen to an easy-going and laid-back one. It gave me an appreciation for what tropical fruit is really supposed to taste like. Then I stood in the Cruz Bay Post Office one day, reading a note in my P.O. Box that simply said, “Call home. Jamie & Ti.” Two months later I was helping open a huge restaurant in Las Vegas. What are the causes that are important to you? As a Commander’s Palace Chef, I’m very involved in our restaurants and the community. I also travel the world representing the food culture of New Orleans. We do partner with all sorts of charitable events and organizations like Hogs for the Cause, United Way, St. Michael’s Special School, and many more. There are a few highlights that have brought me to faraway lands like Africa, Central America, and Israel. I was chosen as a Culinary Ambassador for Australia in 2016, and my job was to throw Fourth of July parties and teach people about what American regional food is really like. You’ve professed your deep-rooted love for New Orleans and Louisiana in past interviews. What do you hold dear specifically? I do love New Orleans for a lot of reasons. It’s a place you can conduct business as a Southern gentleman, with its rich history and traditions, but it’s also the place where you can live a gregarious and hedonistic lifestyle on any given Tuesday. Who wouldn’t want that teeter-totter to have fun on from time to time? I feel proud that I can help carry the torch that so many have carried before me. As we celebrate the 300th birthday of New Orleans and the 125th birthday of Commander’s Palace, I hope that when people look back on these days 300 years from now, they’ll say that maybe our torch sparkled a little brighter at times. I’m thrilled, honored, humbled, and grounded enough to know I’m not taking the opportunities I’ve had for granted.